It is estimated that by 2030, more than 20% of India’s population will be 60 years of age or older. The average lifespan of man has constantly been on the increase and is now placed at 65 years, yet older people use fewer dental services than young adults. The most common dental problems faced by the elderly include root caries, periodontal disease, darkened / stained teeth, toothlessness or missing teeth - all these problems usually are due to neglect of oral care in their younger days, also a tooth-unfriendly diet lacking in essential nutrients, poor oral hygiene practices like not brushing and flossing the teeth regularly, and habits like smoking and chewing tobacco. Studies suggest that 70 percent of elderly persons require some dental treatment; but only 25% perceive this need and only 20% actually seek treatment.Poor health status seems to play a role, as do financial dependence on their children and the fact that they simply refrain to be a burden to anybody. It’s the responsibility of the family to coax the elderly to see the dentist, as he is more than willing to meet their needs with patience and affection. Check out the dental findings and specific oral hygiene instructions for the elderly in the discussion below. 1. Root decay: Majority of dental caries in the older population are root surface decay, which progresses slowly and is generally painless. Regular dental check-ups are essential and if root decay is detected, then the patient should follow a meticulous oral hygiene with daily use of a fluoride toothpaste and fluoride mouth rinse. 2. Dry mouth / Burning mouth: Ninety percent of the medications prescribed can produce dryness of the mouth. This can be treated by frequent intake of water, reduced consumption of alcohol, tobacco, and spicy food. Consult a dentist if fungal infection is suspected. 3. Wearing away of teeth: This is the most common finding in the elderly along with shrinking of the gums exposing the roots leadign to sensitivity and decay. A comprehensive treatment including teeth cleaning, appropriate fillings and desensitizing toothpaste fir sensitivity is advised. 4. Edentulousness (Toothlessness): The National Centre for health statistics has reported a decrease in edentulousness although 95% of individuals with teeth older than 65 years have sever gum disease and tooth mobility. If only a few teeth are remaining or most of them are loose, complete extraction followed by a good set of dentures is best. Here are some suggestions on how to take care of a geriatric patient’s oral hygiene and considering their special needs. * Make sure that that patient visits the dentist every six months for a thorough dental checkup. It’s especially better to find a dentist who specializes in geriatric dentistry. The dentist should be updated of the elderly patient’s health condition and the list of medicines that he/she is taking. * The elderly should religiously brush their teeth twice a day with a gentle bristletooth brush and floss once in a day. Though they may have lost few teeth due to various reasons, they must strive to keep the remaining teeth healthy with better oral hygiene as correct chewing ascertains better digestion of food. Cleaning the tongue with a suitable tongue cleaner is also essential for a clean mouth. Also keep in mind to discard the toothbrush every two -three months or when the bristles start to fray on the ends. * If the person has difficulty in handling a regular toothbrush, one can opt for an electric toothbrush. Electric toothbrushes are excellent at removing plaque and stimulating gums. A demonstration at the dentist’s office on how to use it will help. In case, one doesn’t want to use an electric brush, the existing toothbrush can be modified by bending under hot water. Or handles can be customized with acrylic coating, a bicycle grip, or a rubber ball to enhance the grip for patients with arthritis and other disorders. * Dentures must also be brushed everyday.Do not use household cleanser to clean the dentures as they can damage them. Use only denture powder or paste for cleaning them. 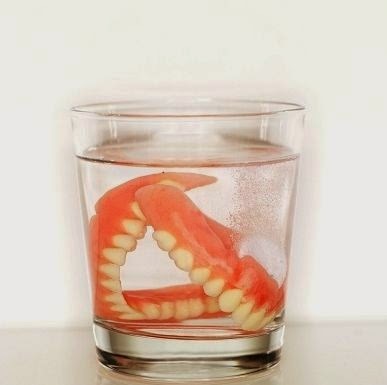 Dentures should be removed at night and kept in a special dish with water and dental cleanser to prevent them from drying. Also removing dentures at night, allows gum tissues to breathe freely. * If one has dry mouth, one must first of all try and find out the cause for it. Is it due to the natural process of aging or is it due to the medications one is taking? This can be discussed with the dentist who will offer you the best suggestions. Keeping oneself hydrated is one of the easiest remedies that can solve this problem to a certain extent; it also has other health benefits. Chewing sugarless gum is another. It’s a fact that an unhealthy mouth increases the chance of medical conditions like heart disease, diabetes etc. and as such its care should not be neglected at any age.